September | 2015 | Wine Etc. I finally opened one of the bottles of California wine my aunt brought with her as a gift when we had a mini family reunion in Massachusetts a few months ago. 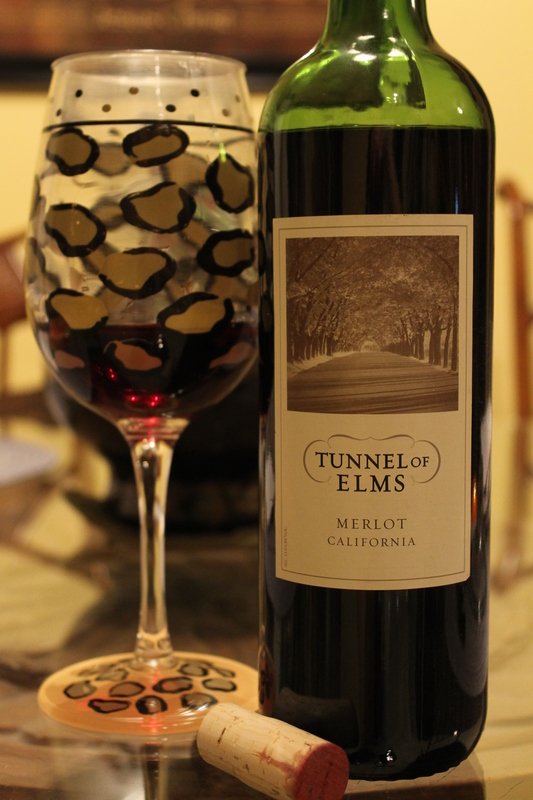 This Tunnel of Elms Merlot is 13.5% ABV and very smooth. Bold and spicy as a Merlot should be, but not too strong of tannins, almost on the sweeter side. Nice finish, not too dry or bitter. Almost fruity. This would be a good introductory Merlot for someone who isn’t used to very dry wines. I finally made it to Cooper’s Hawk Winery & Restaurant in Tampa and it was everything I hoped and dreamed of, and more. 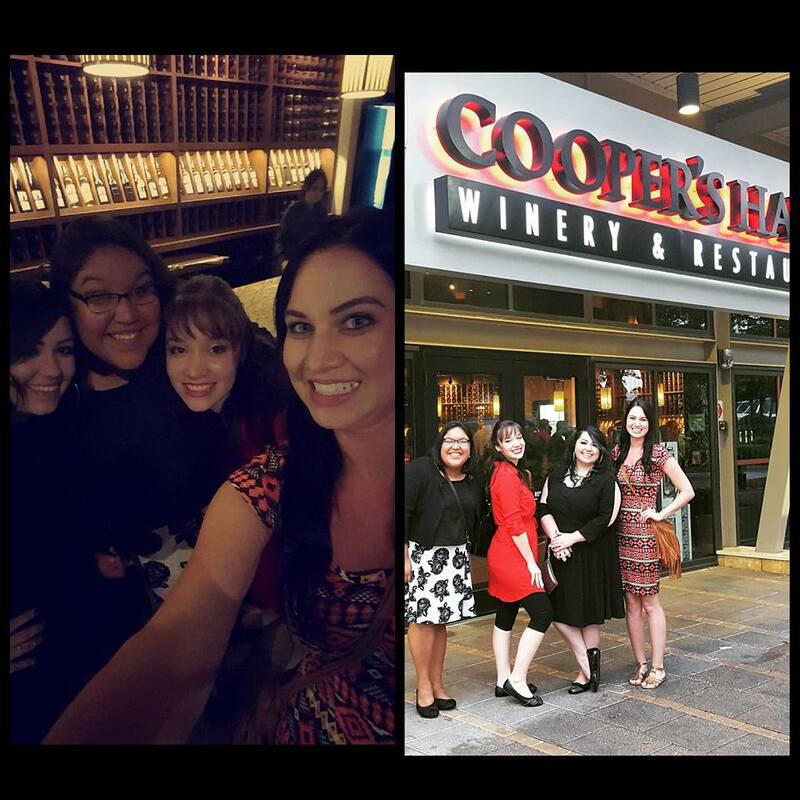 A few friends and I had a ladies night out and the wine alone was worth the trip. You walk into a cute shop where you can buy or taste wine, then there is a separate bar area, and the dining area is also separate in the back with it’s own fancy ambiance. It was very modern and cute, but not very private. That was my only complaint; all the tables were very close together and I could just about see everyone in the whole dining room area. And no, it wasn’t because i’m as ta as a giraffe. We started out with wine flights and at first I was confused why it cost $14 for four wines, but when I realized they were full pours I was happily surprised. Two of us went with the sparkling flight (including myself) and one of the girls ordered the desert wine flight. 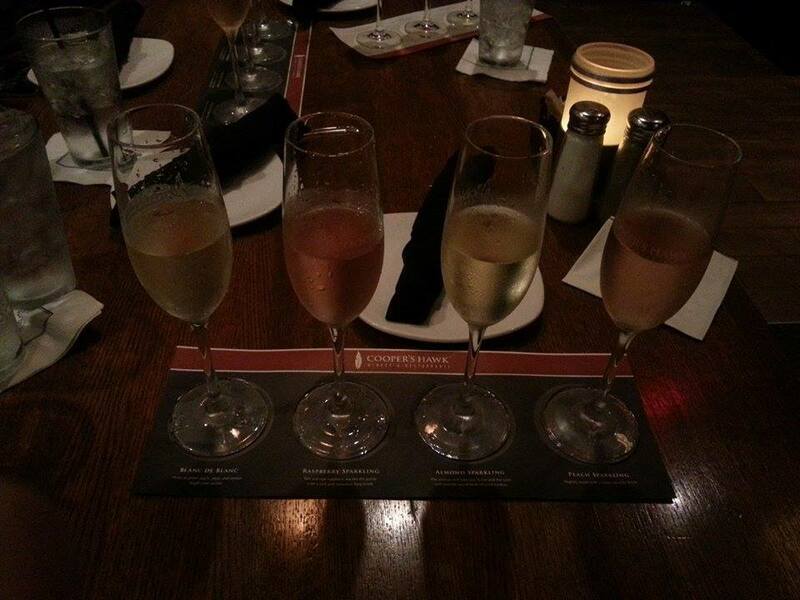 The sparkling flight included the Blanc de Blanc, Raspberry, Almond, and Peach wines. They were all extremely good, but we were all super impressed with the almond. If you’ve never had almond champagne or sparkling wine before, it’s something you should try to find immediately. You will not be disappointed. I took home a bottle for $14.99. Worth every penny. The desert flight included Rhubarb, Peach, Sweet Red and Raspberry. Their wine list was them most extensive I’ve seen in awhile including just about every style of wine you could think of, including ice wine, plus some interesting flavors like rhubarb and passion fruit. We were also blown away by the food. We were not expecting such good quality. 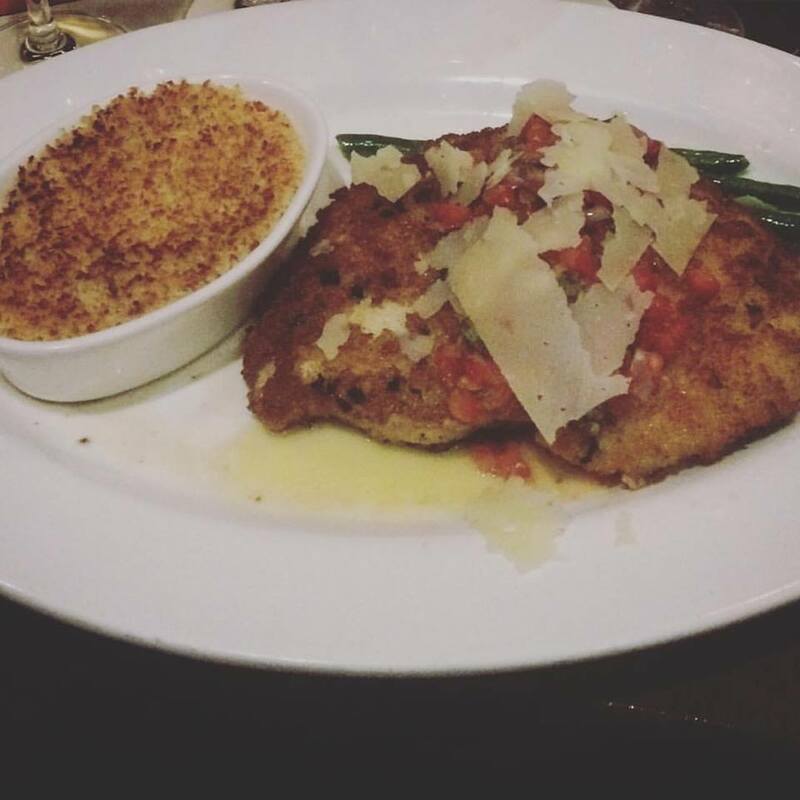 I went with Dana’s Parmesan-Crusted Chicken that came with a side of Betty’s Potatoes and garlic green beans for $17.99. I don’t usually eat a lot of meat and will eat half of a chicken breast and bring the rest home, but this was so flavorful I cleaned my entire plate. Even the shredded potatoes were so cheesy and delicious, I wished there was more of them. But honestly, it’s a good thing I don’t live closer to this place or I would be broke. If you have a Cooper’s Hawk near you and you haven’t been yet, I highly recommend it.